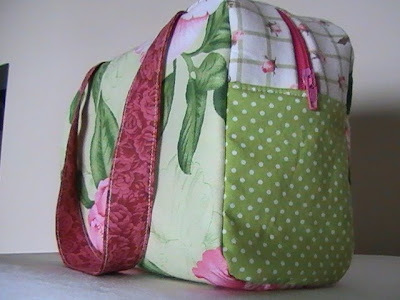 I just had to show you the second bag I've made from the newest design I've been playing with. 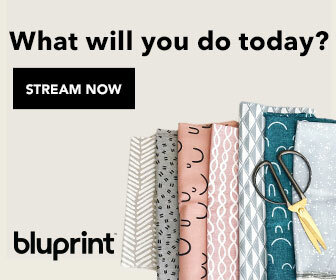 I love the freshness of the Amy Butler fabrics! Then there's the polka dots. 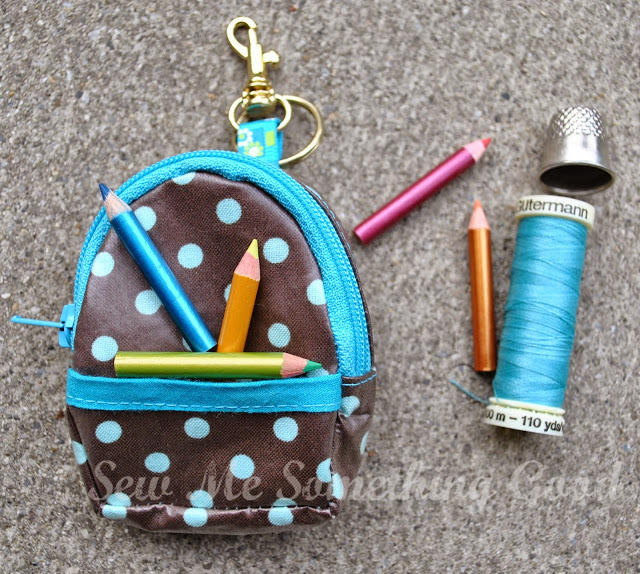 I seem to be craving dots for my projects lately. I want them in every colour. 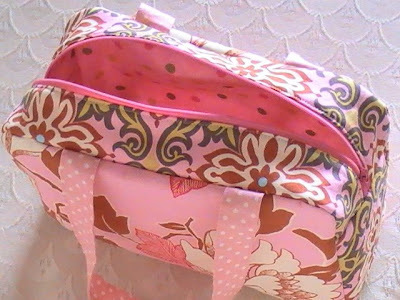 Do you love the polka dot fabric I found for the lining as much as I do? I have a love for flowers. Fresh may be best, but I cannot resist collecting some to be dried to then be used as potpourri or for dried arrangements. 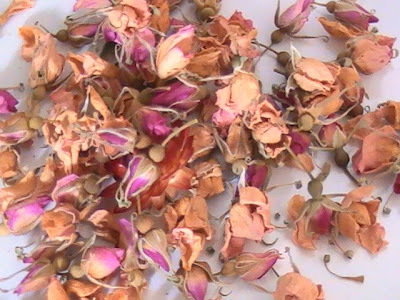 These wild rose buds are a part of my floral stash (yes, I collect more things than fabric!) 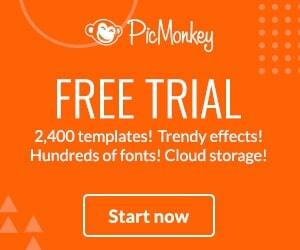 that were begging to be used. 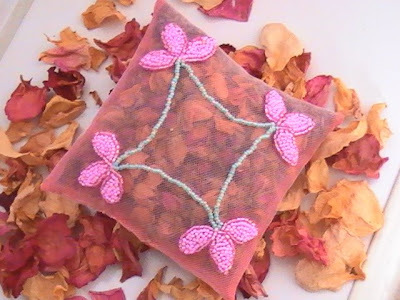 and I made a sweet smelling sachet for a gift. 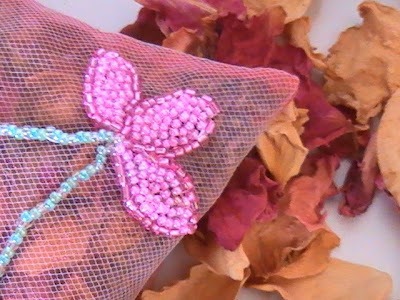 Sparkly beads, sweet smelling flowers and sheer fabric combine to make a girly good treat. 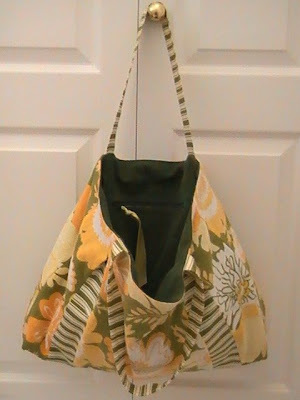 like I did to make this tote. It's made from two pairs of secondhand jeans and a faded cotton tablecloth from the thrift store. 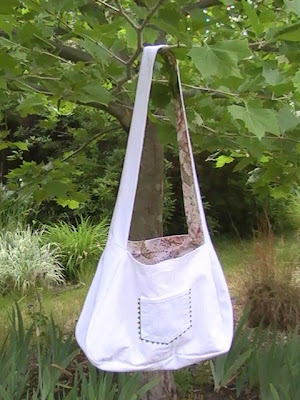 The body and straps of the bag were pieced from the legs of the jeans and a back pocket had to be cut from the jeans separately and then repositioned on my tote. The only extra detail I allowed myself on this simple design was the peek of green ric rac under the pocket. 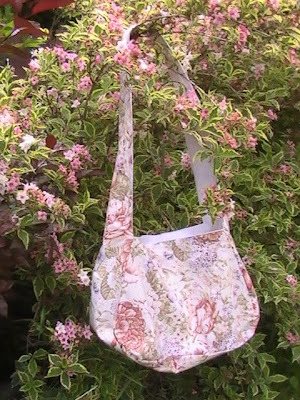 The muted colours of the floral print seemed perfect as the lining... and then I thought it would work to make this tote reversible and decidedly feminine. to get your creative juices flowing (or flowering?). Here's my story...I had (there was a sale on, which obviously necessitates a retail stop) to make a visit to the local fabric store and after finding what I needed, I found something I wanted. The bright pink flowers on the soft green background was begging to come home with me. It was on sale (hear me rationalizing the purchase??? LOL). 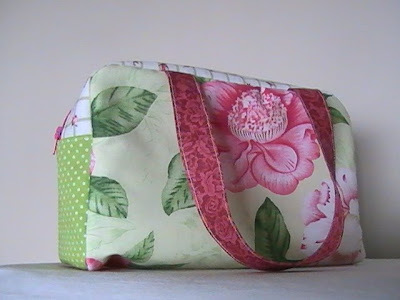 It just so happened it coordinated nicely with other bits in my stash and gave me the idea to make this: and thankfully it had only one hiccup in the pattern drafting (which was easily resolved. Whew.). I've yet to line this bag, so it's still a wip; but so far, so good. 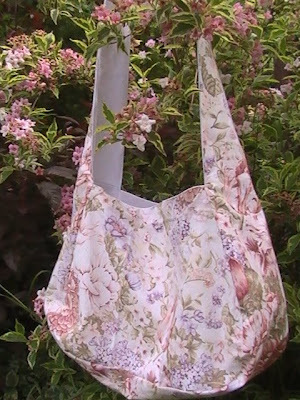 Now that my 'test' bag has been made to try out my idea, I can say with some certainty, I will be making more of these. I've already been playing with other fabric combinations (you should see the fabric mix and mess I've got going on all over my cutting table...) and thinking of details to add to the basic design. 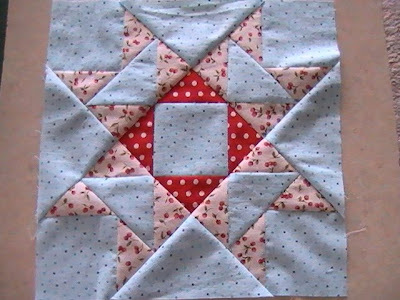 The piecing has been going well for me in the quilt along. 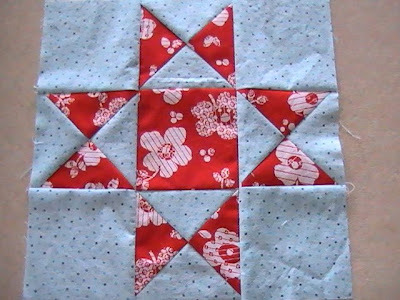 I now have all the setting blocks stitched together and have caught up with the star blocks. Yay! and here's a look at all eight weeks of blocks, shown with the setting blocks (and empty spaces which are for the remaining star blocks coming up in the next few weeks). 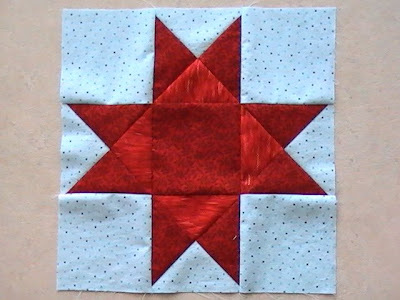 Finishing this block means that I'm one block from being on par with the blocks given by Amandajean in the Star Quilt along. Thanks to better lighting (a sunny day), the colour of my background fabric is looking truer in my photos, so you can tell it's aqua blue and not white, that I've paired with bright red for my blocks. I can't tell you how happy these colours are making me. 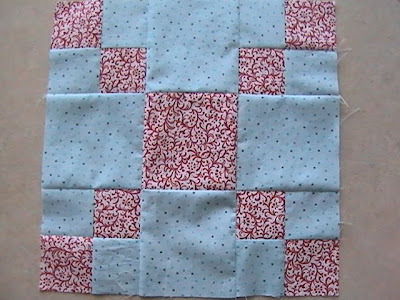 I've also sewn together about half of the setting blocks needed for the quilt top. 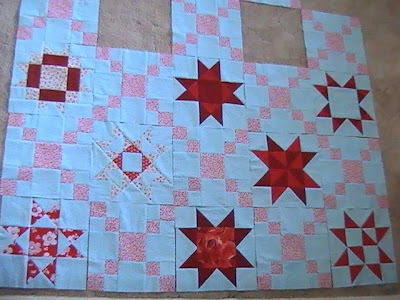 It's so exciting to lay out the blocks and realize that I'm about half done the quilt top. 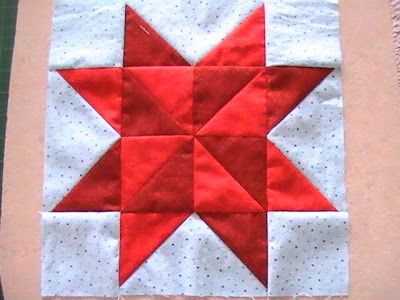 The hardest part will be waiting for the final star blocks to be revealed over the next few weeks because now that I'm this far into making the quilt, I just want to keep going and complete it! I have to show you what happens when a friend tells me how much she likes something I've made. I return to my fabric stash and see if I have enough of the same materials to make her a gift. 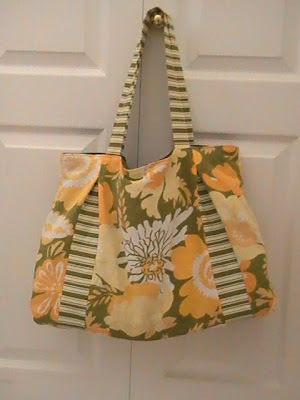 This latest bag is a sister to the one I made that Andrea won in my giveaway a little while back. 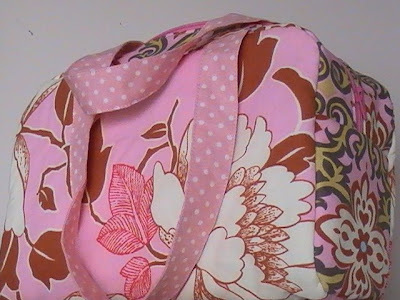 I had just enough of the vintage tablecloth to make this second bag, but not enough of the stripe fabric to use as the lining this time around. Fortunately, my friend likes corduroy, because that's what I lined her new bag with instead of the stripes. Other changes from the original bag are the direction of the stripes and the interior bag pocket. 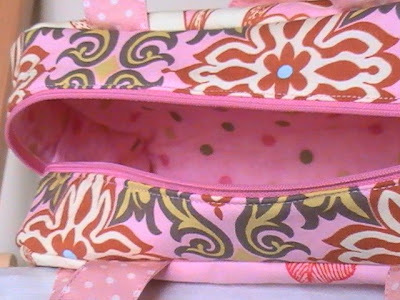 I prefer the zippered pocket on this bag to the patch pocket I had on the first bag. 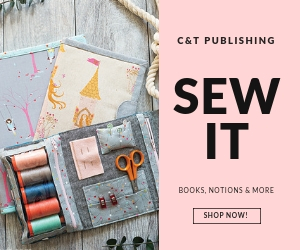 Go here to enter a giveaway to win some redwork stitchery patterns from the generous and talented Lynette Anderson. and here's a shot of all of the ones I've made so far grouped together. 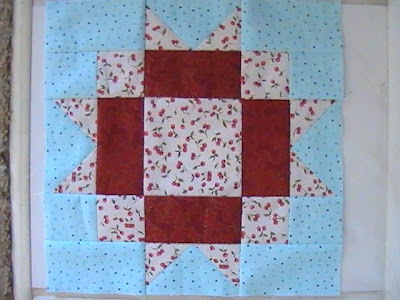 Now I need to choose the fabrics for week #7 and get busy putting together the setting blocks as well. 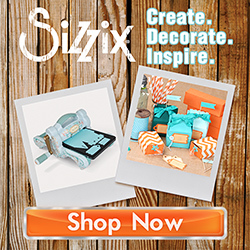 I'm having so much fun with the colour combination of red and aqua! 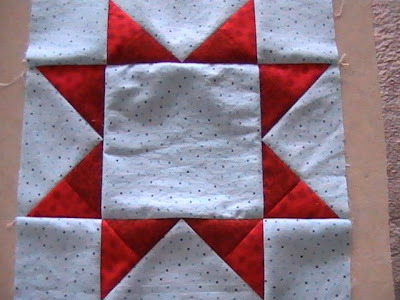 I can't wait to see how this quilt will look when finished. 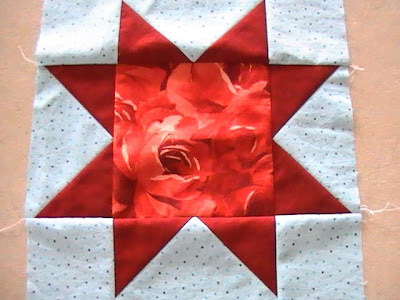 I signed up for Amandajean's Star Quilt along weeks ago, but it has taken me awhile to find the fabric I wanted to use. 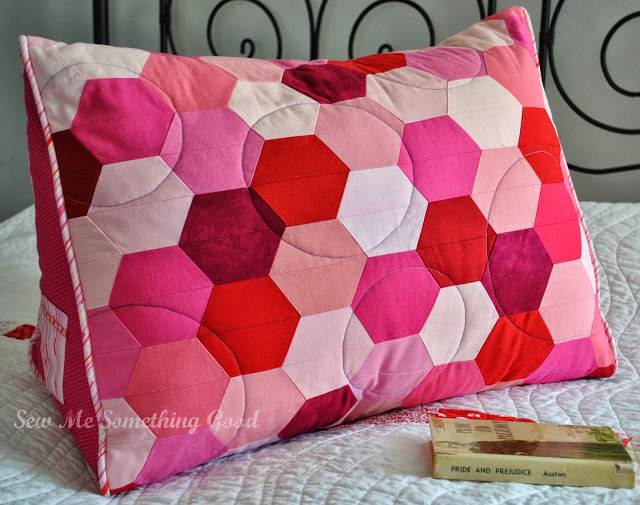 I was inspired by the colours she used in this beautiful quilt, but had to wait until I could collect something similar. 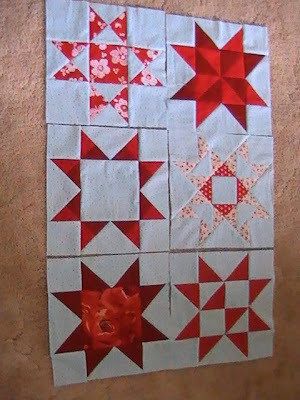 Here's my first three blocks for the Star Quilt she's leading everyone in making. Despite all the dolls I've been making lately, I can make toys for boys too. 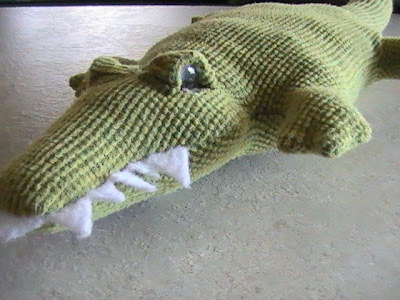 Perhaps one of my favourites is this crocodile made from polar fleece. 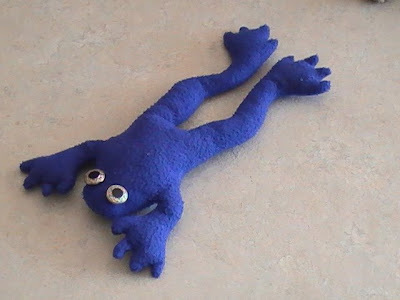 Frogs turn out pretty fun from polar fleece as well (yes, I know he doesn't exactly have child safe eyes, but my son was past the age of pulling the eyes off his toys when I made this for him... actually he chose these buttons for the eyes). 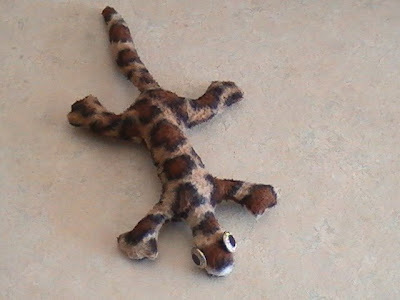 A lizard made from animal print polar fleece is a novelty - the choice made by my son (and again with the eyes... he exhausted my supply of this style of button when he kept wanting them to be the eyes on the bevy of creatures I made for him). These stuffies are the easiest kind to make. Simply draw the outline of the creature on paper, pin the paper to your two layers of fabric and stitch on the drawn lines (remembering of course to leave an opening for turning the creature right side out for stuffing). 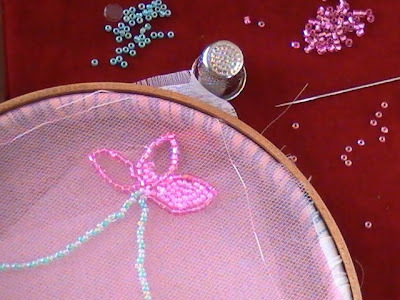 My sons began sewing this way and made some imaginative creatures while building some skills with a fun project. 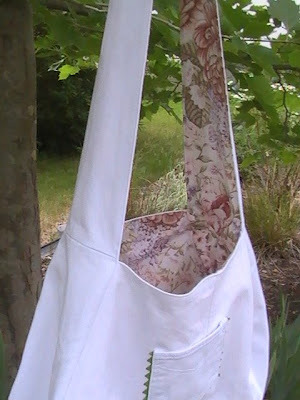 You've got to try this - especially with polar fleece (no fraying and it's every so soft to cuddle). Every now and then I have to try something new. 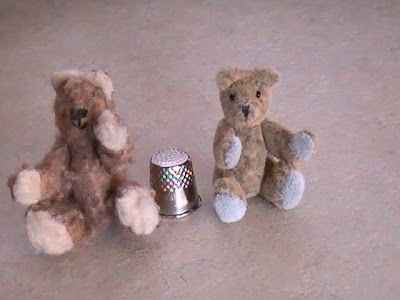 A library book on making miniature teddy bears intrigued me and presented a challenge that I knew I wanted to attempt. Yes, the pattern pieces for the bears are itsy-bitsy and the whole thing must be hand sewn. That wasn't the most challenging part for me as it turned out. This may come as a surprise, but it was finding the right fabric that was tough. Shown above, from left to right, are bear #2 and bear #3. Along with bear #1 (or Chewbacca wannabe as he is lovingly known as), these 3 bears were all made from the same pattern. 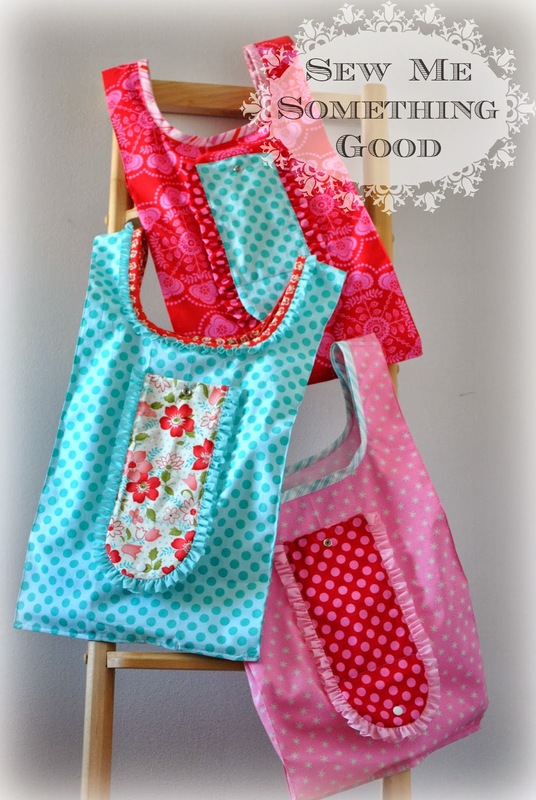 The different fabrics gave drastically different results. 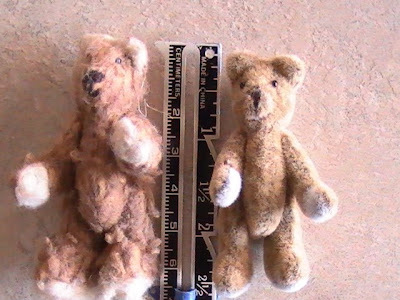 Fun fur didn't work (bear #1), nor did felted plush (bear #2). The best looking bear was made using upholstery fabric (bear#3). 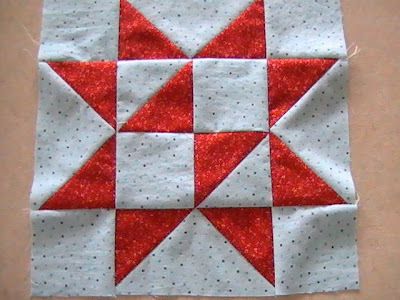 This fabric looks just right (hmmm... doesn't that sound like another story involving 3 bears?) and even allows his seed bead eyes to be visible, unlike the same eyes on his bear brothers. Did you know that this size of bear isn't even the smallest size you can make? Yeah, unbelievably, I made one even smaller. 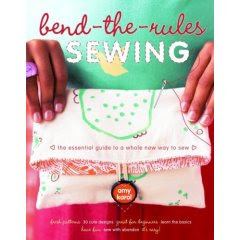 I'm that crazy about sewing/crafting - I will likely try anything once.